Born: 1892, Bury St Edmunds, Suffolk. 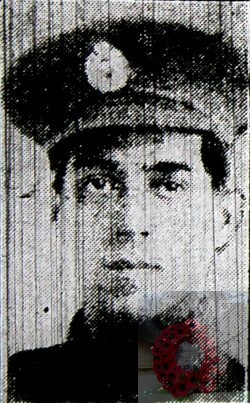 Died: 8th December 1917; age 25; KiA. Employed: Kensington and Notting Hill Electric Light Co., London. Date of Entry Therein: 8th December 1915 – France. Regiment: Royal Engineers, 52nd Field Coy. 1901 43, Priory Street, Ipswich. Bertie was 8 years old and living with his parents & siblings. Harry Edward Alsop, 48, a Blacksmith, born Bury St. Edmunds, Suffolk. Emily Charlotte Alsop (nee Last), 48, born Bury St. Edmunds. George William Alsop, 19, a Blacksmith, born Bury St. Edmunds. Minnie Beatrice Alsop, 13, born Bury St. Edmunds. Harry Edward Alsop, 11, born Bury St. Edmunds. Bessie Blanche Alsop, 6, born Barton, Suffolk. Ernest Wilfred Alsop, 2, born Capel St. Mary’s, Suffolk. 1911 6, King Street, Hammersmith, London. Bertie was 19 years old, a Barman and one of six servants to Charles Oliver Twyford a Public House Manager. Bertie is also remembered on the war memorial at St. Margaret’s Church, Ipswich.